Iran influenced Baghdad's decision to refuse to allow the US to keep troops in Iraq beyond the end of this year, a senior adviser to Iraqi Prime Minister Nouri Maliki has told the BBC. Under the current agreement, the US must withdraw all its remaining forces from Iraq by 31 December. 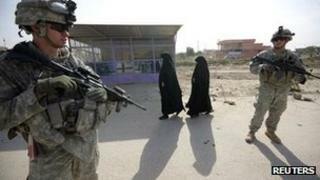 The admission will fuel speculation about Iran's growing influence in Iraq, as US forces leave. Iraq's decision was a humiliating moment for the United States. Washington had lobbied hard, and publicly, for a new agreement that would allow the US to keep a contingent of several thousand soldiers in Iraq. After months of indecision, in October, the government in Baghdad said no - or at least not under conditions acceptable to the Pentagon. Some detected the hand of Iran behind the decision. Adviser Sa'ad Youssef al-Mutalabi says that while the decision had been Iraq's, Iranian sensitivities had played their part. "It is taking Iran into consideration. We understand that there is a certain sensitivity. And we do not want an excuse for the Iranians to intervene in Iraq on the pretext that you have American troops." Washington is acutely sensitive to suggestions that it may have fallen short of its strategic aims in the region. Michael McClellan is the spokesman for the US embassy in Baghdad says: "We are not being pushed out and I don't think it's at the behest of Iran. Since 2003, our objective here has been to have an Iraq that is sovereign, stable and self-reliant. "They are sovereign because they did make their own decision. We did not just come back at them and say: 'Sorry but we're going to keep our troops here anyway.'" There are still some 30,000 US soldiers in Iraq. A little over six weeks from now, they must all be gone, except for a few to guard the embassy and other official buildings. It will mark the end of a war that has cost the America close to $1tn (£630bn) and nearly 4,500 soldiers' lives.